It has been the year of the whale on Long Island Sound, where fishermen and other boaters have reveled in the return of the marine mammals after a long hiatus. The highly unexpected sightings began in May, when three belugas were spotted off Fairfield, Connecticut. A minke whale was seen off Norwalk later in May. And there have been several humpback sightings in recent weeks, including as far west as Mamaroneck, New York, according to records kept by The Maritime Aquarium in Norwalk. Whales haven't been seen in the western part of the sound since 1993, when a 30-foot finback was spotted in New Haven Harbor, said Joe Schnierlein, research and university liaison for the aquarium. Videos and photos of humpbacks breaching the surface have been posted online by boaters, who were both excited and frightened by the close encounters. Chris Curran of Darien, Connecticut, caught a young humpback whale on cellphone video breaching the water about 20 to 30 feet from his boat about a mile and a half off Darien and Norwalk, while he was with his 8-year-old son and his son's friend. Curran said the humpback appeared to be a young whale about 10 to 15 feet long. It came out of the water about nine times, the last time being the closest. "I was having heart palpitations, I was so excited," Curran said. "The boys were fearful for their lives. They thought it was an orca. I was never concerned about it hitting the boat until that last incident. Then I got out of there fast." The whales have been the talk of Long Island Sound, including warnings to boaters from state and federal environmental officials to watch for whales and try to stay at least 100 feet away from them. If a whale gets within 100 feet, boaters should put their engines in neutral and not re-engage them until the whales are clear of harm. Federal law protects marine mammals. Schnierlein believes the whales were attracted by a big increase in bait fish, including menhaden, which are rich in omega-3 oils and calories. He surmises menhaden have thrived for several reasons, including 2-year-old harvesting restrictions on them and a lack of rain. He believes little rain has reduced the amount of pollution-laden runoff that enters the sound. Whale sightings in the eastern part of Long Island Sound also are uncommon events, according to records kept by Mystic Aquarium. The last confirmed sightings before this year were a long-finned pilot whale off Stonington in 2009 and a minke off Old Lyme in 2005, said Janelle Schuh, stranding coordinator at the aquarium. 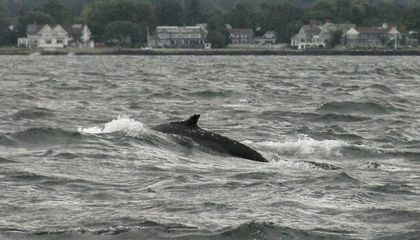 Whales that have become stranded in the sound included a humpback that floated to Stonington on the edge of the sound from Rhode Island in July 2012, a fin whale in New Haven in 1993, long-finned pilot whales in Branford in 1991 and Madison in 1989, and a beluga whale in New Haven in 1986, Schuh said. 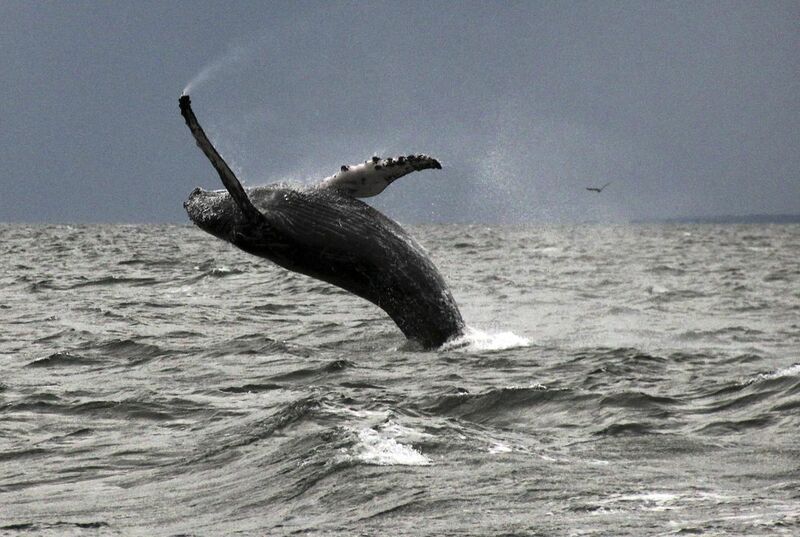 Daniel Lent of Easton, Connecticut, says he believes he saw two humpbacks Sept. 12 off the coast of Stamford. He snapped a photo of one breaching the water. He said it was about as big as his 27-foot boat. "I thought I was staying away a safe distance," Lent said. "Then one came up behind me. That's when I freaked out. It went from being really cool to being really scary." How has a change in the weather caused the whales to reappear? I have always wanted to go whale watching but I've always feared that I would spend the money and not see any whales. However, this article informed me that there has been an increase in whale sighting in the Long Island Sound. I can't imagine what it would be like to be out on the water one day and find yourself sailing alongside a whale, especially a humpback. I might even start to have "heart palpitations", like that one man expressed. Maybe a whale watch wouldn't be such a bad idea for a weekend activity. For the first time since the 1800's, whales have been spotted off the Long Island Sound. Experts say they were brought here because of their food source, but global warming may also play a part. Since shark sightings in the north Atlantic are becoming more common, whale sightings may be too because of the general warming of earth's oceans. These sightings may just be random but if they are because of global warming, the northeast might start to see migrations of many animals moving north. aww this is sad and happyyyyyy!!!!! I really think that these areas where whales are starting to surface should be more protect. Boats that fish near these areas can harm whales when they bump into boats. If too many boats are near whales, it may harm them. The change of weather has caused the whales to come back which could be a good and a bad thing. It could be a good thing because they could start eating invasive species if there are any. It could be a bad thing because they could eat native species. I wonder why they haven't been spotted in a while. Those are some pretty big whales. I wonder if they will be spotted more from now on. The lack of rain caused the the menhaden to come back which caused the whales to come back. Alot of people were excited when the whales came back. I would be excited too if I saw a whale. The weather must've became suitable to the fish. So the fish population increased by either reproduction or migration. Whales migrate to find food so they followed the fish to take advantage of the easy meal. wow! I would have liked to see that sight. it must have been amazing to see it that close! The whales have been gone a long time, and the small amount of rain has stopped the polluted runoff, causing the whales to come back.